This month's edition of Reading with Little Miss Muffet is a few days earlier than usual, because I expect to be in labor near the end of the month and I didn't want to miss my chance to post it! 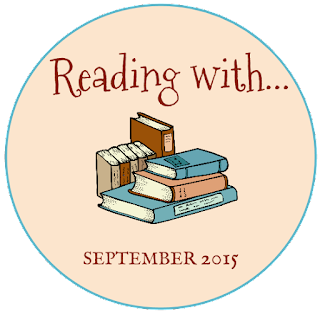 (Beginning next month, I'll be reading with Little Miss Muffet and a newborn, which will be really exciting.) Here is what Miss Muffet has been up to in September. "Upside down!" Little Miss Muffet recently acquired Rain by Manya Stojic from a used book store. A few pages into the story, the baboons appear, one of whom is hanging upside down. If she is reading this book on her own, she immediately announces "Upside down baboon!" and turns the book over so that the baboon is facing the right direction. She then keeps the book upside down and turns the page, thereby ending up on the previous page of the story, which is now upside down. She announces "Upside down!" again, flips it over, turns the page, and winds up once again with an upside down baboon. Eventually, she either skips a page by accident or I take pity on her and step in to help, but it is fascinating to me how many times she will flip between those two pages, just turning the book again and again. I was talking about her understanding of the orientation of a book all the way back in February, but somehow this is more intense! Asking friends' moms to read aloud. As we have been awaiting the arrival of Miss Muffet's sibling, we have been hosting more playdates at home and going out less and less often. The result of this is that Miss Muffet has access to all of her books and to an unsuspecting reader (usually another mom) at the same time. One of my mom friends does voices when she reads (something I have never been able to pull off effectively), and this has prompted Miss Muffet to bring her story after story during our visits, until finally we have to say that books are closed so we can actually have time to chat! I have always liked this book as a story time option because it is so versatile. It can fit into a variety of themes, including weather, summer, the five senses, rainy days, and wild animals, and it has really bright and appealing illustrations. Miss Muffet seems to like it mainly because of the baboon on the front cover, but also because the story includes zebras, lions, and porcupines, all animals which she can readily identify and loves to talk about. She also really likes the page where the rain falls and falls - she can basically "read" it word for word. We are borrowing this book from a mom friend who has three kids and has therefore been through the "bringing home a new sibling" experience twice. I was commenting on the fact that we didn't have a book that talked about babies being born in a hospital, and this one, while not explicitly about welcoming a sibling, has a great illustration of exactly what I had in mind. It's also not as explicit as some of the other books I've seen. It does include the word "uterus," but the creation of the baby is not explained as anything more than cells coming together, and the image to accompany it is a mom and dad holding two halves of a Valentine together, which is kind of sweet. Miss Muffet's favorite part of this book is the moment where the parents hear the baby's heartbeat - probably because she has been to all of my appointments and has had the experience herself! This is another used bookstore find that has fallen in and out of favor of the past few months. There is lots of suspense in the story, as three unsuspecting ducks wander in and out of danger from creatures such as a bull, a family of foxes, a hawk, and a snake. Each time the ducklings encounter a new predator, Miss Muffet raises her eyebrows in anticipation, and then laughs when the ducks escape. I chose the book originally for the illustrations (we enjoy Paul Galdone) but the appeal now is mainly in the plot. Connect books to real life experiences. As Little Miss Muffet becomes more and more verbal, she is able to tell us exactly what catches her attention when we are out and about in the world. When she expresses interest in subjects like birds, dogs, trees, leaves, acorns, squirrels, groundhogs, warm weather, ponds, etc., we try to look for a book, either in our personal collection, or on our next trip to the library, that can provide her with more information connected to these points of interest. This seems to help her remember her experiences, and it increases her vocabulary for talking about specific incidents. Norwegian nine-year-olds Trille and Lena live next door to each other in a small fishing village. Their idyllic lives consist mainly of eating Auntie Granny's waffles, and inventing opportunities for adventures, many of which end in unexpected, but funny, catastrophes. Though Trille is certain that Lena is his best friend, he is constantly preoccupied with whether the feeling is mutual, and he is always seeking confirmation from Lena that she cares about him, too. Due to its setting, and the fact that it is a translation, this book has a very different feel from most other recently published middle grade fiction. The writing style feels very fresh, and the details of daily Norwegian life - including the wearing of wooden shoes! - are completely fascinating. The involvement of Trille and Lena's families in their everyday activities gives the story a gentle warmth, which proves very comforting when sad events sometimes occur, and their various hi-jinks, such as pretending they live during World War II and burying radios, are clever, memorable, and entertaining. The story is the perfect mix of fun and creative adventures and cerebral, introspective reflection. This book is reminiscent of several other titles, new and old. The boy/girl friendship, and the characters' shared imaginary play easily bring to mind Bridge to Terabithia. Because of the similarities, I kept expecting something terrible to happen, but rest assured, Adventures with Waffles is not a tragedy; it just has a similar approach to portraying an important friendship. The Good Master by Kate Seredy (my review for which will appear on an Old School Sunday in December) is another excellent read-alike, as it is also a family-oriented adventure story set in Europe. I would also suggest this book to readers who have enjoyed last year's Quinny and Hopper, which stars another unlikely, but somehow compatible, pair of boy/girl friends. 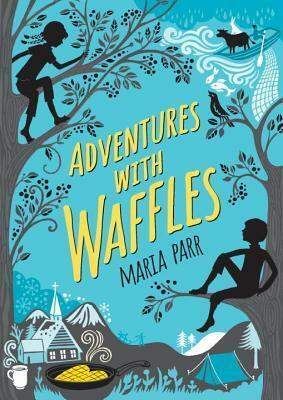 Adventures with Waffles is a perfect novel for elementary students in grades 3 to 5, and it will appeal equally to boys and girls as a read-aloud or for independent reading. Highly recommended. On his fourteenth birthday in 1848, while traveling the Oregon Trail, Francis Tucket receives his very first rifle as a gift from his father. While trying the rifle out for the first time, he is kidnapped by Pawnee Indians and subsequently rescued by a sly and shrewd one-armed man named Mr. Grimes. Mr. Grimes gives Francis the name of Mr. Tucket and takes him under his wing to show him how to survive in the wilds of the West. 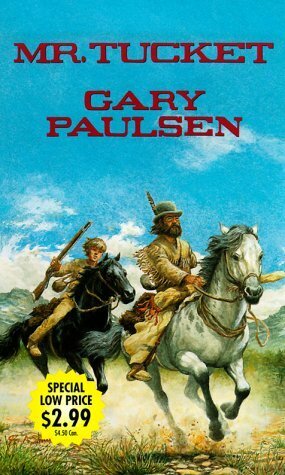 Like most of Gary Paulsen's novels, this is an easy-to-read and action-packed story which moves quickly from exciting event to exciting event. Francis is very likable, and his inexperience and immaturity make him very easy to relate to, even though his experiences are far removed from contemporary kids' lives. The dynamics of his relationship with Mr. Grimes are the driving force of the book, and they are made especially interesting by Mr. Grimes's dubious moral code, a problem which Francis must deal with more deeply as time goes on. The main problem with using this book for educational purposes, I think, is that the story does not end with this volume. Rather, almost every question raised in the story - including whether Francis ever finds his way back to his family - is left unanswered, as there are four more titles in the series. It would be difficult to build a lesson plan based on what is essentially the introduction to a longer saga. Breaking the story up into parts is a wise choice on the part of the author and publisher, because it makes the story more easily digestible for young readers, but it also means this is the kind of book I'd recommend for supplemental pleasure reading, rather than for a more formal novel study. Readers in grades 3 to 7 seeking adventure stories, and especially those who love westerns will devour this book, and they will probably be as eager as I am to dig into the sequels. As an infant, Omakayas was her island's sole survivor of smallpox. Rescued by Tallow, an eccentric older woman she considers an aunt, Omakayas is raised by an Ojibwa family on a neighboring island, where, at age 7, she is now the younger sister of beautiful Angeline and the older sister of bothersome Pinch and sweet baby Neewo. Birchbark House relates four seasons in the life of Omakayas, as she helps prepare the family's summer birchbark house, communicates with bear cubs, helps care for her brothers, listens to stories told by family members, and, sadly, comes face to face with the horror of smallpox once again. Of all the books I've read about American Indians (including Children of the Longhouse, Blood on the River, The Courage of Sarah Noble, The Light in the Forest, and Salt), this one is by far my favorite. Though there is some focus on the differences between native culture and white culture, this book is less about conflict and more about the day-to-day living of the Ojibwa people during this time period. Omakayas is a delightful protagonist, whose plucky personality and authentic emotions toward her family members really make the reading experience such a treat. Even when the sadness of the winter smallpox outbreak sets in, the reader is able to find hope in Omakayas and her indomitable spirit. Readers who like learning other languages will also be pleased to see lots of Ojibwa words throughout the text, and in the glossary of the book. Adding these words to the story and contextualizing their meanings immerses the reader more fully in Omakayas's culture and provides insight into how the Ojibwa view nature, the world, and each other. 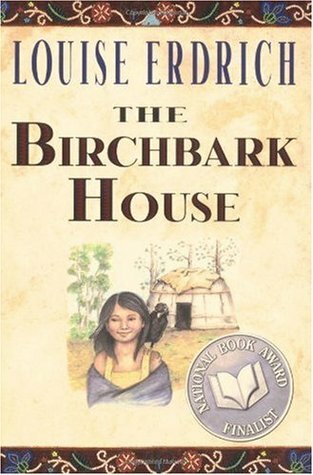 There are four sequels to The Birchbark House: The Game of Silence (2005), The Porcupine Year (2008), Chickadee (2012), and Makoons (2016). When Bill and Sue Melbury move with their single mother to Beckfoot Cottage in Bannerdale, they are surprised to learn that their neighbor, Sir Alfred Askew who owns Bannermere Hall, allows no boats on the lake. Together with Tim Darren, Bill's new friend from the boy's grammar school in nearby Winthwaite, and Penelope (Penny) Morchard, Sue's new friend from the girls' secondary school, the kids set out to investigate why Askew is so opposed to activity on the lake. The surprising discoveries they make while secretly exploring his land soon have them on the trail of a potential murder mystery which might get them in trouble with their respective heads of school, or worse. Unlike the popular mystery novels of its day (Nancy Drew, Hardy Boys, Famous Five, The Boxcar Children etc. ), this book is truly a work of literature. The characters are as well-developed as the plot, and solving the mystery is but one aspect of their rich, interesting lives. The writing is easy to read, yet clever, and there is a delightful underlying humor to the whole story that makes the reader want to spend as much time as possible in Bannerdale. 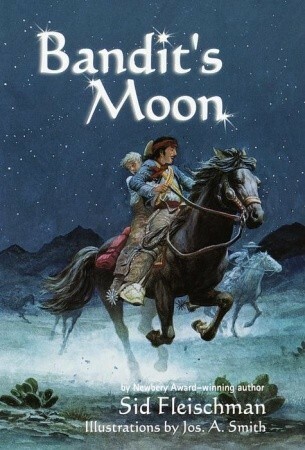 Themes such as single parenthood (Mrs. Melbury) and a physical disability (Penny's limp) disprove the misconception that older books lack diversity and add to the realism of the story overall. Also enjoyable are Tim Darren's earnest desire to be a detective and the gentle rivalry between the heads of the boys' grammar school and girls' secondary school. It's amazing that this book is not better known - or even still in print - as it is one of the best-written titles I have read from the 1940s. No Boats on Bannermere shares much in common with Swallows and Amazons, but because it is written in first person using Bill's voice, the reading experience feels more like a personal conversation with a friend (similar to the Henry Reed books) than an observation of adventure from the outside looking in. While it is fun to imagine oneself having the adventures enjoyed by the Swallows and Amazons, it is much more likely that average school kids would have experiences similar to those which happen to Bill, Sue, Tim, and Penny. Because the world of the story is so ordinary, it is easier to relate to the characters and to feel genuinely surprised when unusual (but still plausible) events begin to occur. 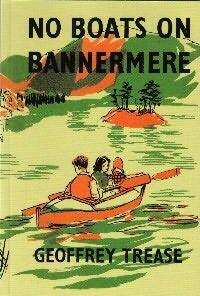 No Boats on Bannermere is the first in a series of five titles. 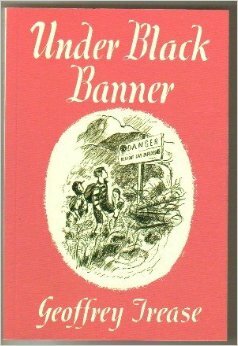 The sequels are: Under Black Banner (1951), Black Banner Players (1952), Black Banner Abroad, (1954), and The Gates of Bannerdale (1956). Lydia "Lyddie" Worthen, the oldest of the four Worthen siblings, has had to take on the roles of both father and mother after her father's abandonment of the family and her mother's descent into mental illness. When her mother sends her to work as a maid in a tavern, Lyddie discovers that she could make much more money each week working in a factory. She spends the last of her meager savings to travel from Vermont to Lowell, Massachusetts, where she is hired to work the looms in a textile mill. Though Lyddie's primary motivation is to make enough money to be able to return home to her family's cabin, others she meets have different priorities, including going to college, helping ailing parents, and making changes to unsafe working conditions. 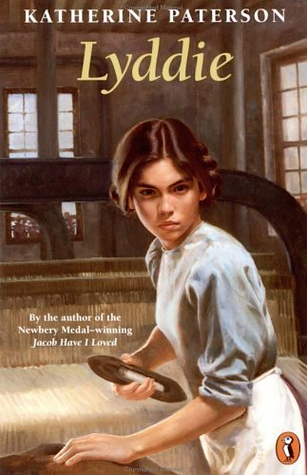 This book provides wonderful insight into the dangers and difficulties of life as a factory girl, delivered through one of the most compelling female characters in children's literature. Lyddie's family history, and her experiences at the mill are not happy, for the most part, but her grit and determination in the face of hardship after hardship and sadness after sadness gives the story a subtle sense of hope that keeps the reader invested even when Lyddie's future looks bleakest. Lyddie, in her quiet, inconspicuous way, models for the reader how to continually regroup and persevere in the face of tragedies and setbacks. By telling Lyddie's story, Katherine Paterson personalizes the horrible conditions under which factory workers were forced to do their jobs, thereby helping readers to grasp their reality, and the motivation behind the labor policies that came later. While I generally dislike books where the main character falls in love with the work of a famous author, Lyddie is an exception. Lyddie's excitement upon first hearing Oliver Twist, and her enthusiasm for reading the book again and again until she nearly has it memorized, humanizes her a little bit, and allows the reader to see a more vulnerable and emotional side to her otherwise tough-as-nails personality. Because Dickens wrote about factories and child laborers- and specifically about the textile mills in Lowell - it also makes sense for Lyddie to be aware of him, and to react strongly to his work. While some authors use story threads like this to wax poetic about their own love for a specific writer or work, Paterson's use of Dickens is logical and suitable to the story, which is truly refreshing. This also provides an opportunity for kids to read both Lyddie and Oliver Twist and to discuss their connections. 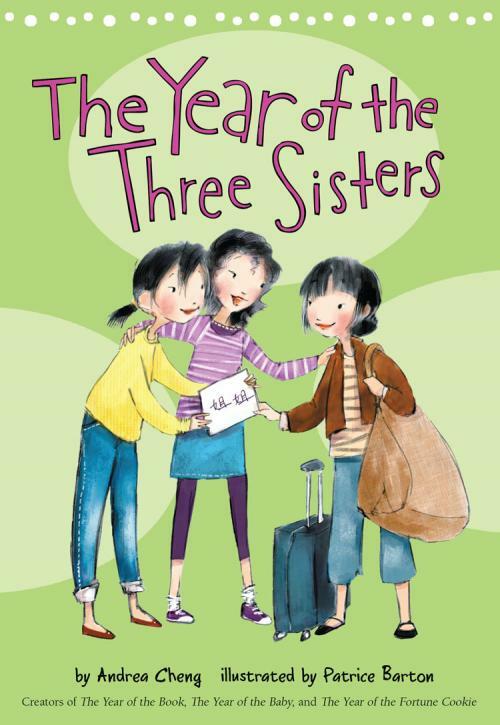 The other aspect of this book that brings in some softer emotions is Lyddie's relationship with her brother, Charlie, from whom she drifts further and further away throughout the story. Whereas Lyddie and Charlie are essentially the parents of their broken little family at home in Vermont, they are forced to separate in order to make their own ways in the world, and Lyddie's affection for Charlie, and the uncertainty of when the two siblings will be together again is a driving force beneath her persistence and seemingly limitless strength. Seeing how their relationship changes is one of the most poignant storylines of the entire plot, and it drives home the sadness and difficulty of Lyddie's circumstances in a very powerful way. This is a book I will absolutely want to share with my own children as they study 19th century America. It's educational but never dry, and utterly engrossing, to the point that I read the entire thing in one day because I couldn't stop. Lyddie is a character I won't soon forget, a fact I think will be true of every reader who takes the time to enjoy this novel.